Story Continues In: Sadly, Nova ended with issue #25 with plenty of plot threads unanswered. Many of those were resolved in the pages of Fantastic Four #206 to #214 and in ROM #24. Overview: Meet Rhomann Dey, a dying member of the Nova Corps, a police force from the planet Xander. Piloting his spaceship to Earth, Dey is pursued by the villainous Zorr the Conqueror. Knowing that he has little time left, Dey scans Earth to find a replacement to transfer his powers. So, meet Richard Rider, just your average teenager in the outskirts of New York City. Trying to enjoy an ice cream sundae with his girlfriend Ginger, Rider is struck by an energy beam from space. Rider wakes up later in the hospital to discover he can shoot energy beams from his eyes and now has incredible intelligence. When he concentrates, his outfit changes to the costume of the Nova Corps, complete with the bucket helmet. So what do you do when you’ve been given powers from an alien? You become Nova, America’s newest teenage super-hero. Now, every good superhero needs a rogue’s gallery, and Nova finds himself trading blows with the likes of Powerhouse, Condor, Diamondhead, the Corruptor, and the Sphinx. He even crossed paths with long-standing villains, such as the Sandman and the Yellow Claw. Throw in a crossover with everyone’s favorite web-slinging hero, and the newest member of the Marvel universe is set. What makes this Essential? : Nova is an interesting character, first conceived by Wolfman and Wein in the mid-1960s. Finally seeing publication in the mid-1970s, the character of Nova was tweaked to be a new version of Spider-Man: a teenage super-hero in the suburbs of New York with an alliterative name (Peter Parker, meet Richard Rider). Given his own set of re-occurring villains, Nova had to juggle the demands on his time – completely homework, hiding his dual identity from his family, and saving the world at least once a week. And yes, his origin does owe a tip of the hat to the Silver Age Green Lantern. 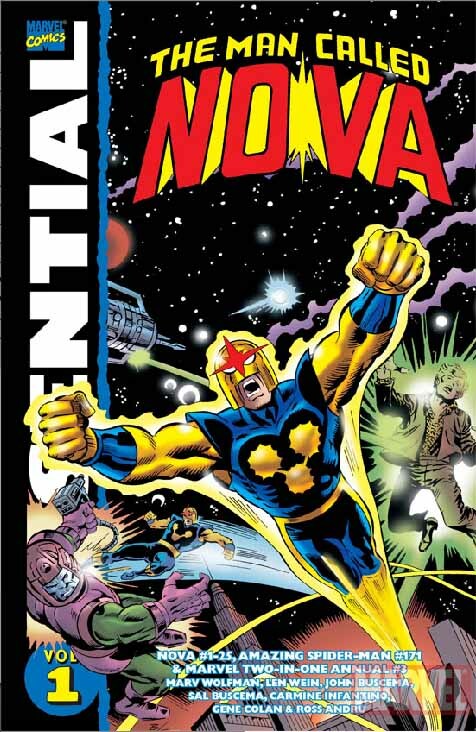 Like many other titles that debuted in this era, Nova may not have been the commercial success out of the gate like Amazing Spider-Man was a decade earlier, but the character did connect with a fan base. As some of those members of the fan base entered the comic book industry, they brought back into focus the characters they grew up with, leading to the Nova revival in the 1990s and 2000s. So, the stories in this volume are adequate. A lot of them do feel like a rehash of the Lee-Ditko Amazing Spider-Man issues of years past. What makes this Essential, and why it should be read, is the legacy it built for the next generation of comic book creators and readers. Footnotes: Nova #12 and Amazing Spider-Man #171 were also reprinted in Essential Spider-Man Vol. 8. Marvel Two-in-One Annual #3 is also reprinted in Essential Marvel Two-in-One Vol. 2. If you like this volume, try: the new Nova series by Jeph Loeb and Ed McGuinness. Based on the Nova character introduced in the Ultimate Spider-Man cartoon, Sam Alexander is a young teenager growing up in Carefree, Arizona. His father has been missing for years; maybe he was out on another drunken binge, or maybe he was serving in the galactic Nova Corps. Sam’s life is turned upside down when he receives a visit from Rocket and Gamora from the Guardians of the Galaxy, offering Sam his dad’s Nova Corps helmet. Suddenly, Sam is a teenage super=hero. This is a fun book that works for all ages. I have been reading this book to my kids each month, and my son is a big “Buckethead” fan. This has been collected in hardcover and trade paperback, making it easily accessible however you choose to read it. This entry was posted in Marvel Essentials, Nova and tagged Carmine Infantino, Gene Colan, John Buscema, Len Wein, Marv Wolfman, Nova, Ross Andru, Sal Buscema. Bookmark the permalink. Pingback: Throwback Thursday – Essential Nova Vol. 1 – WORST. COMIC. PODCAST. EVER!